In the early days of Fairview Park, a small group of retired teachers from the Fairview Village school system was like family and wished to continue its relationship even after retirement. In the summer of 1971, a group gathered for a social evening and the idea of organizing as a progessional retired group began to take shape. The earliest recorded minutes, dated October 9, 1972, reported that the group met for a potluck supper. A slate of officers was presented and the election named Anne Trocke, president; Lucy Millsom, vice-president and Lillian Bailey, secretary-treasurer. 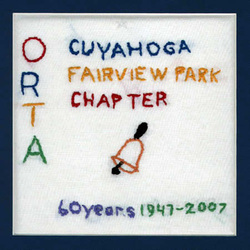 In the spring of 1973, Mr. M. R. Simpson, District X Director of ORTA, guided the Cuyahoga Fairview branch through the procedures of preparing a constitution and by-laws and affiliating with the Ohio Retired Teachers Association. At that time membership totaled thirty-six. After one sweltering August meeting in 1993, the CFRTA voted to hold future meetings at the convenient and comfortable air-conditioned public rooms of The Renaissance, a local retirement community. Four times a year this meeting site sees a large contingent of the present 104 membership gather for lunch, conversation, meaningful speakers and entertainment. A nine-member Board plans and directs local activities.